Background: Fever is one of the most common medical problems in children that needs immediate medical attention. The objective of the study was to gauge the knowledge of parents about fever in their children and what treatment methods they do at home to treat it through a questionnaire. Patients and Methods: The study involved random selection of Saudi parents who have had febrile children. Parents were interviewed using a standard questionnaire to obtain sociodemographic information and to assess their knowledge about fever. The study also determined methods that the parents were using at home to treat fever. Results: A total of 353 parents completed the questionnaires. The study sample consisted mainly of mothers (62.3%). Most of the parents who participated in the study have one child (47.3%) followed by parents who have two children (42.8%). There were only three parents who have more than four children (.8%). Most of the parents were between 18-30 years old (46.7%) followed by parents between 31-40 years old (40.5%). There were only seven parents who were older than fifty years (2%). Most of the parents attained a college/university degree (47.9%) followed by parents who had secondary certificate (34.6%). Interestingly, eight parents had a post graduate degree (2.3%). Fifty four percent of the parents are working (192) while the other forty five percent are not (161). A total of 38% of the parents believed that the best place to take the temperature of the child is the ear (tympanic) followed by armpit (axilla) 37.1%. The rest of the parents took temperature orally (21%) and rectally (4%) . In this study, about 43% believed that 37 degrees Celsius is the normal body temperature of a child followed by 36 degrees Celsius (20.4%). Approximately 30% of the parents considered a child with a temperature of 38-38.4 degrees Celsius as feverish followed by 38.5-39.90 degrees Celsius (26.3%). In this study, 73.1% of the parents did not believe that alternating drugs is useful in cases where the temperature did not lower after administering an antipyretic drug. Almost 50% of the parents believed that seizure is the complication of fever followed by brain damage, dehydration, coma, and death. Parents most frequently reported measurement of a childs temperature was best by using an electronic thermometer (34.8%) followed by an ear thermometer (28.3%). Other parents measured the temperature of their child by using their hands and with a mercurial thermometer. Most parents measured the temperature every 30 minutes to 1 hour (37.4%) followed by every 15 to 30 minutes (23.2%). When asked about the drug usually given to the child to reduce fever, the majority of the parents reported giving paracetamol (80%) while the others gave antibiotics (9.3%), ibuprofen (4.8%), and aspirin (1.1%). We also found that most of the parents use physical methods to relieve and treat fever such as tepid sponge bath with cold water (38.8%), cold showering (24.9%), tepid sponge bath with hot water (21.5%) and other methods. In order to determine the right dose of the antipyretic drug administered to the feverish child, 85% of the parents used a specific measuring spoon or syringe containing the drug. Others used a regular teaspoon or tablespoon. Most of the parents when asked how the right fever lowering drugs and doses was decided, they indicated that they would follow the previous advice from the pediatrician (43.6%, 39.4%). Others consulted a pharmacist, or others, or relied on information gathered from media. Conclusions: This study shows that parents should be more aware about high body temperatures and its consequences. There should be more health education among parents to correct the misconceptions they have about fever. Also, parents should be informed about different home treatments and their consequences. There is a need to develop programs that educate parents and provide them with information they need to better address the fever of their children. Our body temperature is controlled by the hypothalamus. There are two types of signals being received by the hypothalamus. These signals are assimilated by the thermoregulatory center of the hypothalamus to maintain normal temperature. The human metabolic rate produces more heat than is necessary to maintain the core body temperature in the range of 36.537.5°C (97.799.5°F) in a neutral temperature environment (1, 2). Body temperature measurement is most commonly done to confirm the presence or absence of fever. Many decisions concerning the investigation of children are based on the results of the temperature measurement alone. An incorrect temperature measurement could result in delayed detection of a serious illness or alternatively an unnecessary infection. A number of researchers published in the international literature have reported that parents have different conceptions, often erroneous, in relation to the exact temperature values considered as fever in childhood. Thus, concerns about fever are composed of incorrect associations between the peak of the fever and severity of the disease. Concerns about fever by parents may be real or imagined and therefore assessment and monitoring of temperature is essential for decision making at home and in hospital settings (4). The study was made to assess the understanding of the parents with children regarding high body temperatures and to know the methods they use at home as treatment aside from giving medications. A total of 353 parents completed the questionnaires. 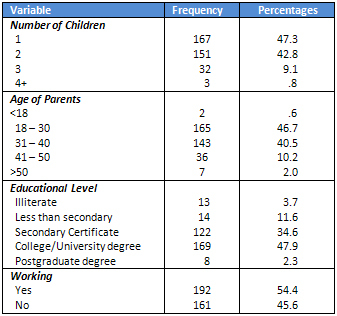 The distribution of the socio- demographic characteristics of the parents who participated in the study is shown in Table 1. The study sample consisted mainly of mothers (62.3%). Most of the parents who participated in the study have one child (47.3%) followed by parents who have two children (42.8%). There are only three parents who have more than four children (.8%). Most of the parents are between 18-30 years old (46.7%) followed by parents between 31-40 years old (40.5%). There were only seven parents who are greater than fifty years old (2%). Most of the parents attained a college/university degree (47.9%) followed by parents who had secondary certificate (34.6%). Interestingly, eight parents had post graduate degree (2.3%). Fifty four percent of the parents are working (192) while the other forty five percent are not (161). 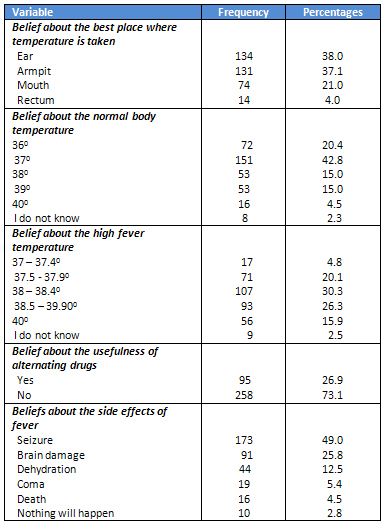 Table 2 shows that 38% of the parents believed that the best place to take the temperature of child is the ear (tympanic) followed by armpit (axilla) 37.1%. The rest of the parents took temperature orally (21%) and rectally (4%) respectively. In this study, about 43% believed that 37 degrees Celsius is the normal body temperature of a child followed by 36 degrees Celsius (20.4%). Approximately 30% of the parents considered a child with a temperature of 38-38.4 degrees Celsius as feverish followed by 38.5-39.90 degrees Celsius (26.3%). In this study, 73.1% of the parents did not believe that alternating drugs is useful in cases where the temperature did not lower after administering an antipyretic drug. Almost 50% of the parents believed that seizure is the complication of fever followed by brain damage, dehydration, coma, and death. 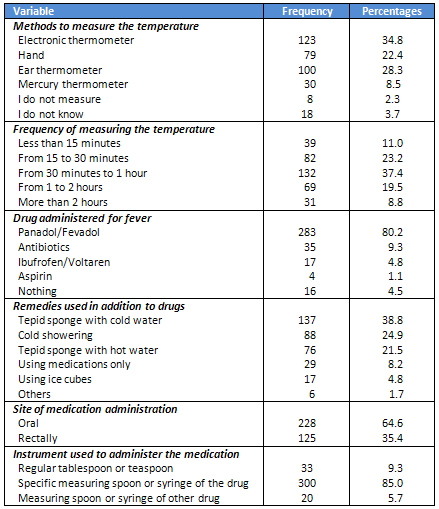 As shown in Table 3, parents most frequently reported measure of childs temperature was by using an electronic thermometer (34.8%) followed by an ear thermometer (28.3%). Other parents measured the temperature of their child by using their hands and mercurial thermometer. Most parents measured the temperature every 30 minutes to 1 hour (37.4%) followed by every 15 to 30 minutes (23.2%). When asked about the drug usually given to the child to reduce fever, the majority of the parents reported giving Panadol/Fevadol (80%) while the others gave antibiotics (9.3%), ibuprofen (4.8%), and aspirin (1.1%). We also found that most of the parents use physical methods to relieve and treat fever such as tepid sponge bath with cold water (38.8%), cold showering (24.9%), tepid sponge bath with hot water (21.5%) and others. In order to determine the right dose of the antipyretic drug administered to the feverish child, 85% of the parents used a specific measuring spoon or syringe containing the drug. Others used regular teaspoon or tablespoon. Most of the parents when asked how the right fever lowering drugs and doses were decided indicated that they would follow the previous advice from the pediatrician (43.6%, 39.4%). Others consulted a pharmacist, consulted others, or relied on information gathered from media. Overall, the prevalence of administering fever-lowering medications orally among this study sample of parents was 63% (Table 4). The route used to administer fever-lowering drugs was found to be significantly associated with age, gender, and number of children. The level of knowledge about high body temperatures and methods used by parents to treat fever at home were identified through the questionnaire provided to them. The data gathered indicates that the parents had a good level of understanding regarding high body temperatures. Most of the parents who answered the questionnaire knew the correct normal body temperature and can determine whether their child is febrile or not. Parents expressed that taking temperature alone was sometimes the basis for administering medications especially antipyretics. Most of the parents believed that giving antipyretics is necessary when there is high grade fever. (5) For them, if high grade fever is not treated accordingly, it will result in complications such as seizures, coma, and even death, as similar to previous research. (11,12) These results are similar to study findings in other countries such as Kuwait and Palestine. However, it is not evident that the parents are aware that lowering the body temperature or giving medications for fever such as antipyretics guarantees the prevention of convulsions (6,7,8,9). Although febrile convulsions are terrifying to parents, they do not affect the neurological function and will not cause disabilities(10). Also, no parents were able to mention any side effects of taking antipyretics. A study in Denmark showed that parents were hesitant in giving medication to their febrile children due to some side effects (13). Lack of awareness and misinformation about the inability of antipyretics to prevent convulsions, and that these medications have side effects may be the reason for the significant use of antipyretics (14). Medication histories of the respondents revealed that most of the children were given antipyretics. According to Okposio, intake of antipyretics and antimalarials is only by perception of the mother regarding fever (15). Some of the parents give antipyretics even when there is minimal or no fever because they believe that a child must always maintain a normal temperature (16). Out of 353 parents, only 79 use hands in determining if their children have fever. Therefore, it is not the preferred method for assessing body temperature. Similar results have been seen in some other studies. A 33% PPV (Positive Predictive Value) for touch technique was declared unreliable as found by Katz-Sidlow (17). In an Indian study by Chatuverdi, only 38% PPV endorsed that the tactile technique is an unreliable screening test for fever. It is recommended that the use of thermometer should be encouraged in assessing fever (18). Studies found that there are home treatments used by parents when it comes to fever, such as showering, cold sponge bath, ice bag application and even rubbing the body with alcohol. These methods may actually increase fever and can result in shaking, shivering and may lead to coma (19)(20) However, more than 90% of parents in the study answered that they use these methods to reduce their childs fever. This study shows that parents should be more aware about high body temperature and its consequences. There should be more health education among parents to correct the misconceptions they have about fever. Also, parents should be informed regarding different home treatments and their consequences. There is a need to develop programs that educate parents and provide them with information they need to better address the fever of their children.